I’ve never really caught on to this British idea of the lettuce as mere salad vegetable. The Chinese aren’t alone in cooking them; you’ll find lettuce simmered gently in French soups and especially in dishes with peas. Cooked, the lettuce becomes silky and sweet; a totally different beast from the salad leaf you’re used to. 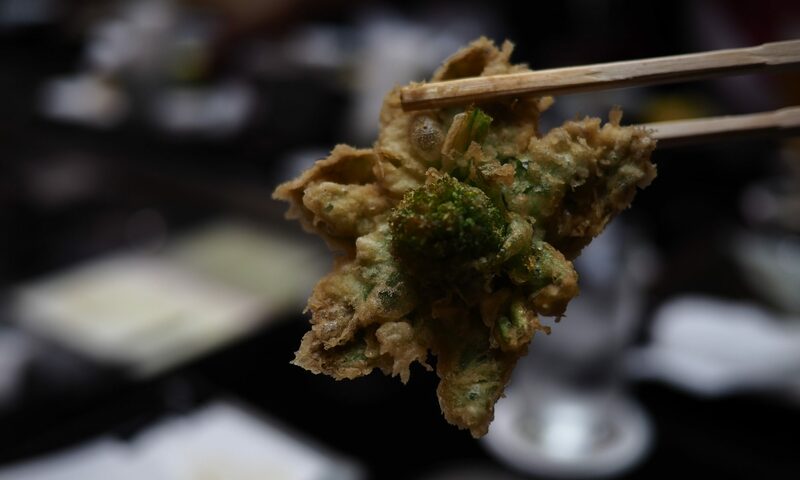 In China, you’re much more likely to find a lettuce cooked than raw. 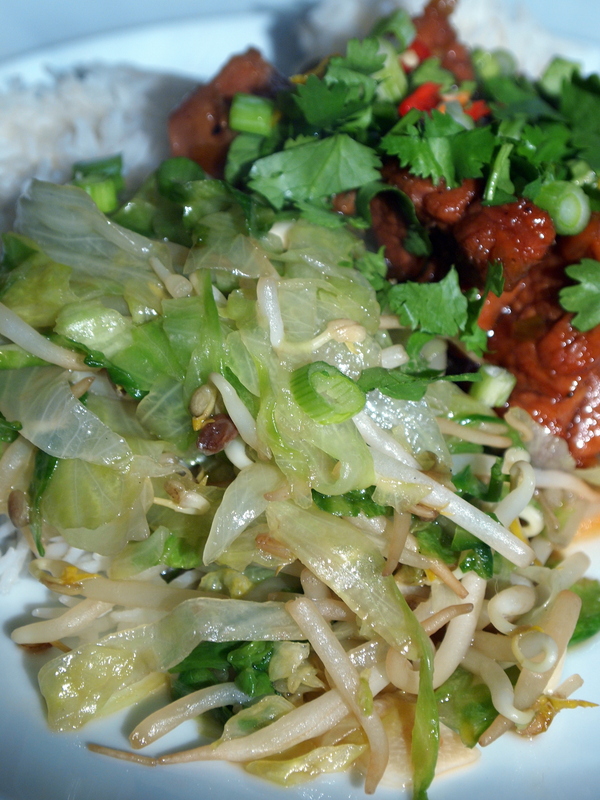 This preparation works very well with the spicy, rich, Vietnamese caramel pork from the other day; in Chinese terms, its clean, fresh flavour would be described as being Yin, against the Yang of the pork. This philosophy of food strives to balance the body – if you are prone to cold fingers and toes, and have a slow heart rate, you’re considered to have an excess of Yin. If you’re sleepless, sweaty or jittery, Chinese grandmothers would tell you you’ve too much Yang. Yang foods tend towards richness: think chestnuts, squashes, onions and garlic, meat, ginger, coffee, alcoholic drinks and fruits like peaches, mangoes and cherries. Apples, bananas, asparagus, watermelon (as distinct from cantaloupe, which is Yang), shellfish, lettuce, beansprouts, citrus fruits and cucumbers are among the foods considered Yin. Bring a small amount of oil to a high temperature in a wok. Throw in the sliced garlic and stir-fry for ten seconds, then add the beansprouts to the pan and continue to cook, stirring all the time. After three minutes, add the liquid ingredients, bring to a simmer and add the lettuce. Cook, stirring, until all the lettuce is wilted, and serve immediately. I’ve lost the magic USB string for my camera. No matter – I did take some pictures of this recipe, and will put them up as soon as my magic string makes an appearance. 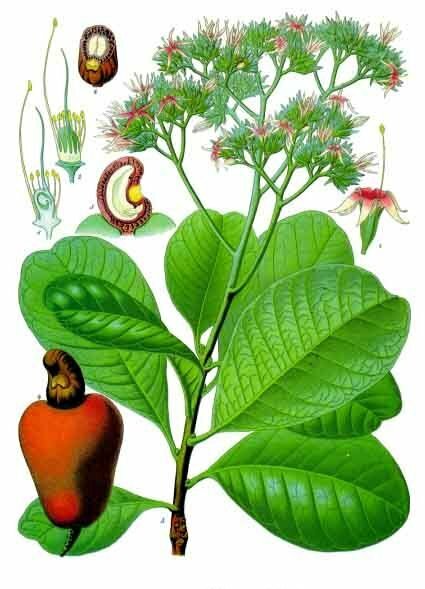 In the meantime, here is a placeholder botanical print of a cashew nut borrowed from Wikipedia. Chicken with cashew nuts pops up on Chinese restaurant and takeaway menus the world over, all with slightly different saucing and attitudes to things like batter and breading. Where I come from, we neither batter nor bread our chicken in this preparation, but if you can’t bear missing out on the missing cholesterol, feel free to bread/batter and deep-fry your marinaded chicken before you add it to the stir-fried sauce and vegetables. 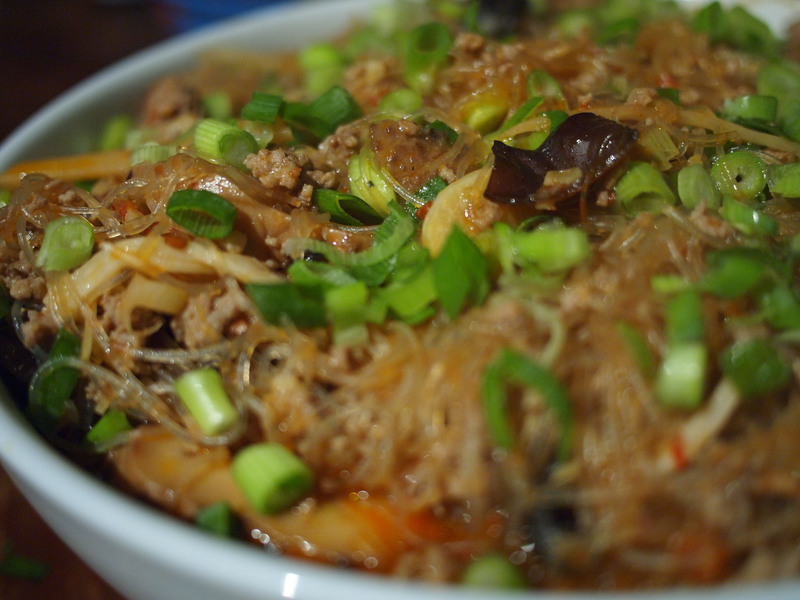 The sauce here is made up from hoi sin with smaller amounts of chilli bean and black bean sauces – all from jars, and all from your local Chinese supermarket. If you don’t have access to these ingredients locally, try the excellent Wai Yee Hong, whom I’ve found to be superbly reliable and well-stocked over the last year or so. Unsalted cashews are no longer very hard to come by – most supermarkets will stock them in their whole foods section. It’s very important that you don’t use salted cashews here; all the above sauces, and the soy sauce in this recipe, are pretty salty, and salted cashews will be overpowering. Start by preparing all the ingredients for stir frying. Marinade the chicken pieces in 1 glass Chinese rice wine, 2 teaspoons cornflour, 2 tablespoons light soy and 2 teaspoons sesame oil for half an hour while you chop the garlic finely, dice the peppers and chop the spring onions on the diagonal into chunky pieces. In a hot frying pan without oil, toast the cashews for a few minutes, keeping them on the move with a spatula, until they are browning nicely but not burned. Heat the ground nut oil in a wok until it begins to smoke. Stir fry the garlic for a few seconds, then tip in the chicken and its marinade, and stir fry until the chicken is half cooked through. 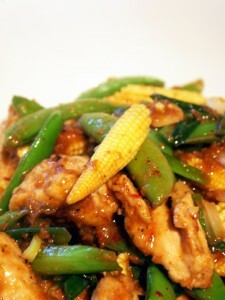 Add the spring onions and peppers, and continue to stir fry until the chicken is cooked and the vegetables are softer. 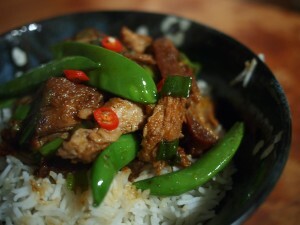 Add the hoi sin, chilli bean and black bean sauces, stir well and then add the remaining glass of rice wine. Simmer the chicken and vegetables in the sauce and add two teaspoons of cornflour made into a paste with a little cold water to thicken the sauce. 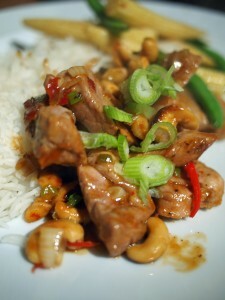 Cook for another minute, stir through the cashew nuts and two teaspoons of sesame oil, and serve immediately. Totally delicious and – dare I say it – probably nicer than what’s on offer at your local take-out.